Major Gifts ($100K - $1M) and Primary Gifts ($1M+) represent large-scale investments in the Faculty and often endow a program or centre in perpetuity. Major and Primary gifts have helped to build teaching and research facilities, attract outstanding professors, and support students through scholarships. Similarly, Special Gifts are larger contributions that focus on a particular area of support. By making a pledge over a number of years, or pooling all support into one type of gift, alumni and friends can make an impact on research projects, buy valuable equipment, and create student prizes and travel bursaries. For more information, please contact angela.crowly [at] mcgill.ca (Angela Crowly )at 514-398-6590. 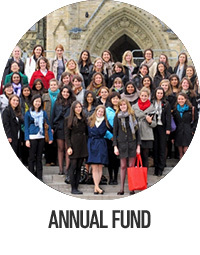 Many friends and Alumni renew their support of the Faculty of Arts on a yearly basis. The main recipient of Annual Fund Gifts is the Dean of Arts Development Fund. These funds are allocated at the Dean’s discretion to support faculty projects, as well as undergraduate and graduate learning. When making a gift online or by cheque, please be sure to indicate the Faculty of Arts as the recipient. If you would prefer your gift be used to support a specific department or initiative, please be sure to communicate this as well. For more information, please contact sophie.babinski [at] mcgill.ca (Sophie Babinski )at 514-398-3294. 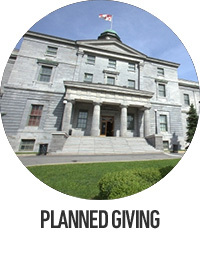 McGill University owes its existence to the foresight of a generous planned gift. The university was founded in 1821 with a bequest from the estate of Scottish-born Montreal merchant James McGill. McGill has since grown from a small college to one of the world’s leading research and teaching universities, thanks to the extraordinary legacy of many generations of supporters. A planned gift can help you achieve your tax and financial goals, as well as your philanthropic goals, and it can help you make a much larger gift than otherwise possible. Your gift can provide direct funding, or it can establish an endowment, for the faculty, school or department of your choice. 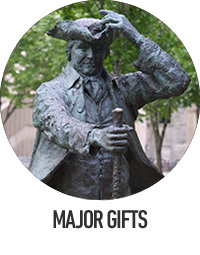 You may also make your gift in honour or in memory of a special person in your life. With a little planning, you can create a truly lasting legacy for generations to come. (The information presented here is of a general nature and is not intended to constitute advice to any particular person). For more information, please contact donna.henchey [at] mcgill.ca (Donna Henchey) at 514-398-3559.